Sport Ireland chief executive John Treacy says mixed martial arts will have to accept proper regulation for it to continue in the country. 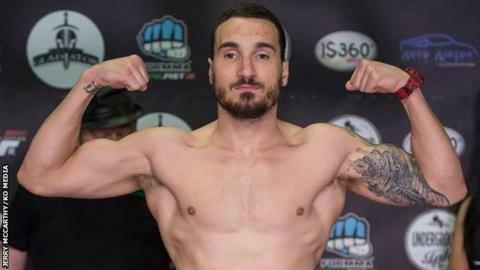 The Sport Ireland chief's comments follow the death of Portuguese fighter Joao Carvalho after a contest in Dublin last weekend. Treacy said Sport Ireland will put forward safety guidelines for MMA. "If they are not followed, I don't think there is any place for it in Ireland," Treacy told RTE Radio. Currently MMA is not regulated by Sport Ireland, the overall umbrella group which funds and has overall responsibility for sport in the Republic of Ireland. Irish Sports Minister Michael Ring has now asked Sport Ireland to bring forward guidelines for the extreme sport which has become increasingly popular in the country following the success of Dubliner Conor McGregor. "The situation with the MMA in the country is that there isn't a national organisation. It's made up of promoters and individuals," the Sport Ireland chief told RTE's Morning Ireland programme. "We sat down with them about two years ago. We said that they needed to form a corporate body in some way if they wanted to be recognised as a sport. "I believe they have rules and regulations with regard to having doctors in place and what have you but the sport is an extreme element of sport. There is danger there." Following Carvalho's death, Treacy believes that MMA promoters and organisers should think long and hard before opting to put on more events in Ireland. "You look at the events of last weekend. There is, I suppose, some history in terms of brain haemorrhages and what have you in the sport. "I would think any promoter putting on events in Ireland at the moment, they would want to be looking at it very, very carefully and making sure they have the rules and regulations and that the safety of their players and athletes is paramount." Carvalho, 28, was taken to hospital after being beaten in a fight at the National Stadium in Dublin by Laois man Charlie Ward on Saturday night. Despite undergoing emergency brain surgery, Carvalho died on Monday.